Chapter Cover story: Bellamy is sitting and trying to draw a skull jolley roger under a light bulb surronded by paint buckets with a trashcan next to him filled with torned pieces of paper. then we see a beautiful farm that has varitey types of food, looks like Kaido's. Centaur-women gifter appereantly, her hair colour is splitted to black and white, she looks hot from far away but when you look closely in the next panel she has a horseface-smiling look, However she has a decent looking chest. Holdem's lion is holding o-tama between his jaws, while Zoro Luffy and O-kiku and the dog are looking at him. Hawkins just entered the town riding his animal and, there is a person standing in front of him holding a sword and covering his face with straw-thingy, It's Law but Hawkins didn't recognise him but he's suspecting something. One of Kaido's subordinates captured O-kiku, Zoro And Luffy didn't do anything, As if they were saying help yourself out. 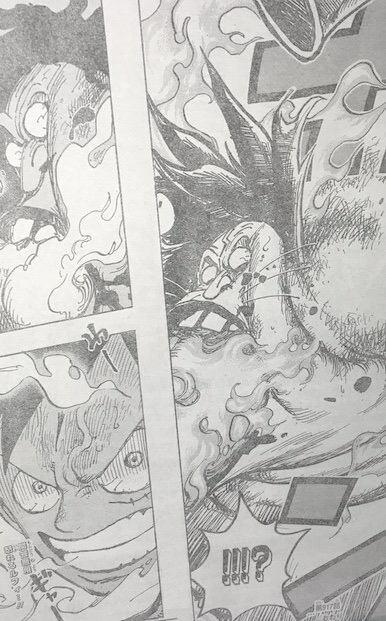 Luffy and Zoro are looking at holdem, and suddenly the lion that holds O-tama got hurt, His teeths got smashed and blood is coming out, Luffy punched the lion in the mouth. 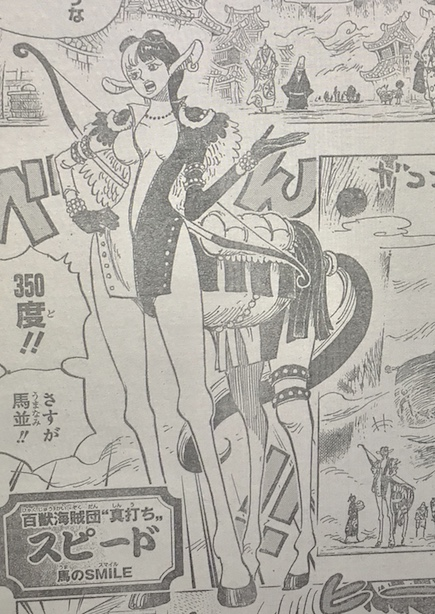 Luffy took the cart that Kaido's subordinates were carrying and attached it to the dog, (The same dog that was carrying them in the earlier chapters). and took with him both O-tama and O-kiku. Luffy was carrying O-tama after he rescued her, The lion spits fire on Luffy but he immediately dodged it and dropped O-tama at the same time. 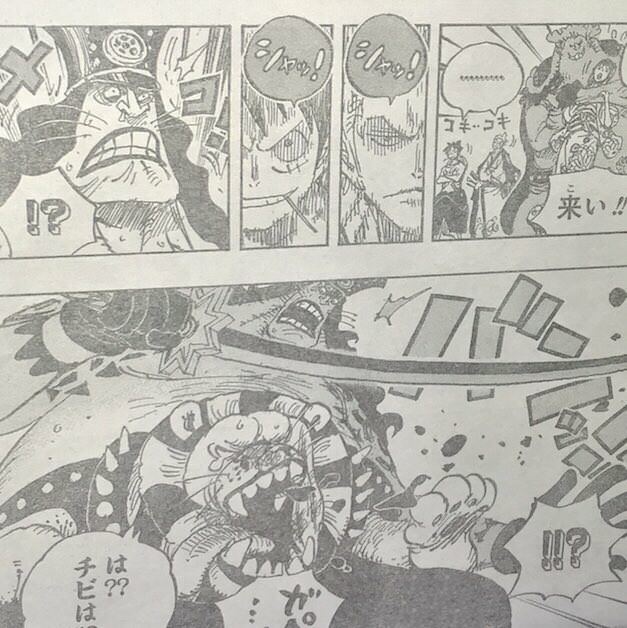 Luffy punch Holdem with a massive Red Hawk, The drawing here is the exact same panel when Luffy punched Charlos in sabaody arc.